From the heartland of Australia’s leisure and pampering universe on the Gold Coast, Annabel Trends is a family run company that’s cornered the market on fresh, fashionable items for you and your home. You'll feel like making a special appearance outside your bathroom door when you wear one from this collection of fetching Annabel Trends Shower Caps. 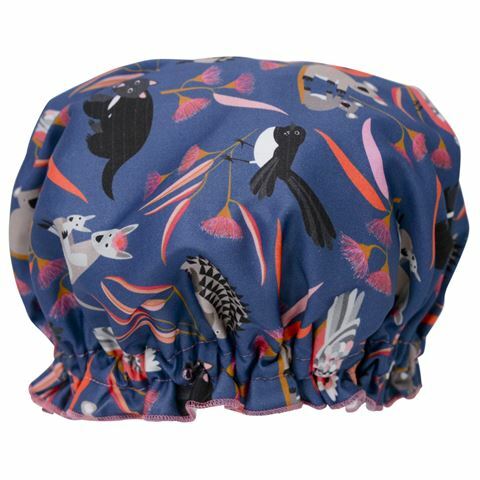 Decorated with exotic floral and Australian native animal themes in pure cotton with durable fabric inside to keep your blow dry intact. In fact, all you'll need to complete your look is a luxury bottle of shower gel. Relax like an Aussie with Annabel Trends. Crafted from 100% cotton and durable material. Features fun motifs and exotic floral designs. Presented in an Annabel Trends clear box.